How was I supposed to feel about this stranger who brought exotic deer to our house for the sole purpose of judging my behavior? My kids are scared of Santa Claus. Well, that’s not fair. That makes it sound as if it’s their fault. It’s not, really. It’s in their genes. Because my wife and I are scared of Santa Claus, so are the kids — they had no chance. My spouse and I discovered our shared Santaphobia early in our courtship. It was part of the back-and-forth of a budding relationship. What’s your favorite movie? What kind of music do you like? 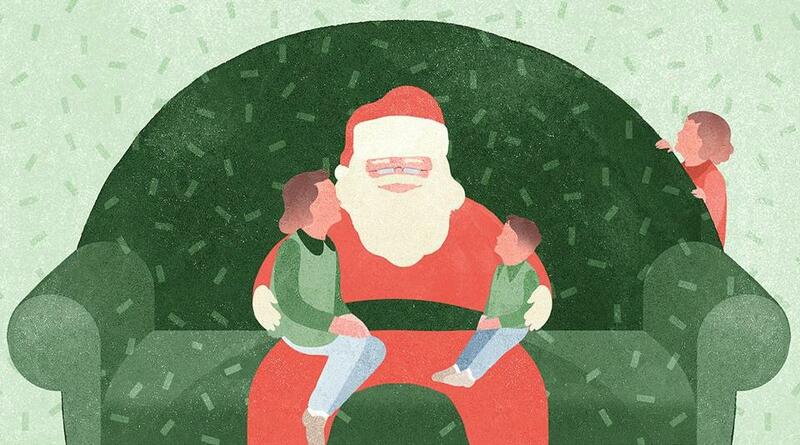 How comfortable are you around mall Santas? We’re both the middle children of three. We were also both the crying siblings in pictures with Santa. Or at least the ultra-nervous-looking ones. Most of my childhood photos with good old Saint Nick feature my siblings and me in matching red sweaters: my younger brother grinning from ear to ear, my older sister smiling obediently, knowing it’s the most sensible way to get this over with already, and me. I look like some sort of wizard because, as best as I can tell from my pose, I have no idea what to do with my jittery hands, which flutter into a kind of tense, outstretched position, as if I’m attempting to cast a spell on the photographer. My wife’s pictures show her in tears . . . if her parents managed to get her into the shot at all. I can’t pinpoint exactly why I fear Santa. The obvious reason is I never loved the idea of a stranger coming into the house while I was sleeping. But it’s more than that. I was a people-pleaser who took the threat of being deemed “naughty” instead of “nice” more seriously than most. Also, I grew up in the city, and wildlife was a foreign element to me. How was I supposed to feel about this man who brought exotic deer to our house for the sole purpose of judging my behavior? Old home videos from Christmas Eve show my brother and sister excitedly preparing for Santa’s arrival, putting out snacks (Santa enjoyed Scotch and cookies at our house) and reindeer food (rice or carrots). Every so often the camera would pan past the couch, where I could be seen curled up in the fetal position, waiting for bedtime, putting us one step closer to morning, when the uncomfortable part would be behind us. Christmas Day brought the excitement of presents and the relief that Santa had come and gone, not to return for another 364 days. I thought I was alone in these feelings . . . until I met my wife. We didn’t know for sure that we’d pass the trait on to our own children. But after a couple of Christmases with them in our lives, we recognized telltale signs of our terrified young selves in our offspring. As an adult, I’ve matured. I liken Santa these days to a raccoon because 1) both are scary, no matter how many reindeer you surround them with, 2) both will eat whatever garbage you leave lying out for them, and 3) I don’t want to encounter either of them in my living room. Still, we feel compelled to put some snacks out for the seasonal intruder in the look-at-me outfit (Santa enjoys Scotch with his cookies at our house as well), and we breathe a collective sigh of relief as we open our presents on Christmas Day. My wife and I are aware we’re the adults in this situation. We know we need to set a positive example for our kids and try not to let them see our fear. If there’s a silver lining to the Santa situation, it’s that we have each other — our own little support group. There’s one other benefit, for our kids at least: We’ll never make them take a picture with Santa at the mall. John Sucich is a writer and comedian living in Framingham. Send comments to connections@globe.com.